As I have been in Kyoto these past few days, I have been thinking about dear Scott from our Israel trip, who, every time Marty asked if we enjoyed our day, would say, “Today was my favorite day!” That’s exactly how I feel here every day, too–although so far, today really has been my favorite day! Part of the reason for this is that it was full of wonderful adventures–but even by my standards, packed pretty full, maybe even a little over-full. I got back to my room around 4:00 pm [after leaving at 8:30], and I already have my Japanese jammies on! [It is called a yukaka, a nice Japanese robe.] After I finish my blog, I am going downstairs to the public bath. [Did I already explain about that? This is a Japanese-style hotel, and one of the characteristics of that is the public bath. What that means is that in addition to the bathtub and shower head in my room, there is also a room downstairs where one can shower off, and then get into a very hot shallow tub of water. Again, not co-ed!] It is going to feel very good after my long day today. 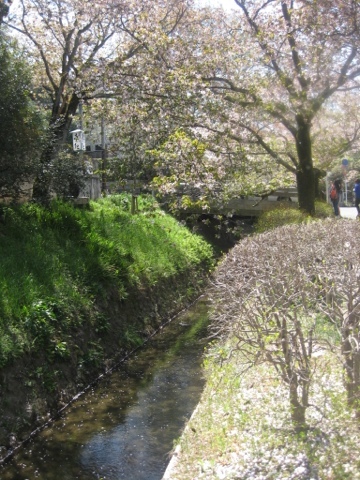 So, today, I wanted to hit the highlights of the Northern Higashiyama area [my hotel is in the Southern Higashiyama area, and before I change hotels on Friday, I want to make sure I have exhausted everything around here.] So, I decided that I would walk all the way up to Ginkaku-ji, a particularly beautiful temple fairly far north, and then walk back home, stopping to tour the other temples along the way. The best thing about this was I got to walk along the famous “Path of Philosophy” coming and going. (Reminds me of the “Philosophenweg” in Heidelberg, another one of my favorite cities. Another great place for running/walking.) 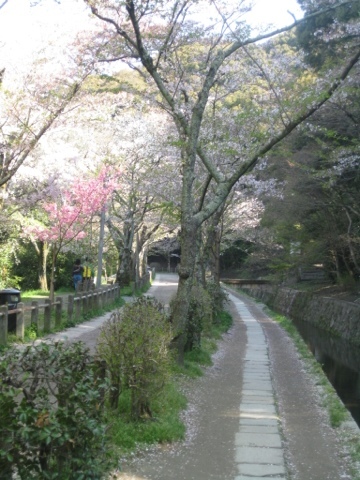 Not only is it absolutely gorgeous, full of cherry trees, but it is also named for one of the most famous members of the “Kyoto School” of Buddhist thought, Nishida Kitaro. I studied his work while I was doing my doctorate, so it was very cool somehow to be walking along his path. 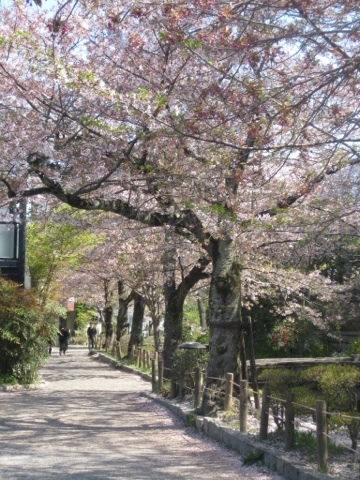 And even though the blossoms continue their rapid fall, the trees still look amazing–it was a gorgeous walk. The temple itself was very beautiful, too. 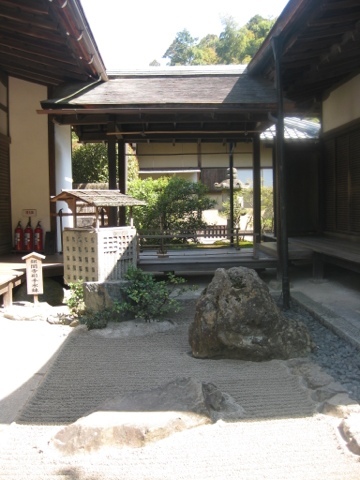 It is a Zen temple [all the temples I visited today were Zen temples], and it was established in 1482. Then, after an interlude I’ll describe shortly, I visited three more temples. 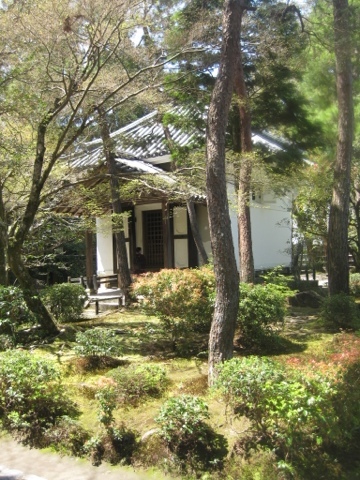 First, Honen-in, founded in 1680; this was unassuming, quiet, and a nice contrast to the bustle of Ginkaku. Then, I went to Eikando Zenrin-ji temple. This was built in the 9th century CE, and it is most famous for its “looking back Buddha”–it’s a great story. In 1082, the then-chief priest of Eikando, Eikan, was chanting the Nembutsu [the name of Amida Buddha] as he walked around the statue, and suddenly Amida came down from the pedestal and began walking away, motioning for Eikan to follow him. Eikan was rooted to the spot, however, and unable to move. At this, Amida looked back at him and called to him to come. As a result of this vision, a statue in this form was made. Finally, I stopped at Nanzenji–a big temple complex with lots of smaller temples and lots of land. 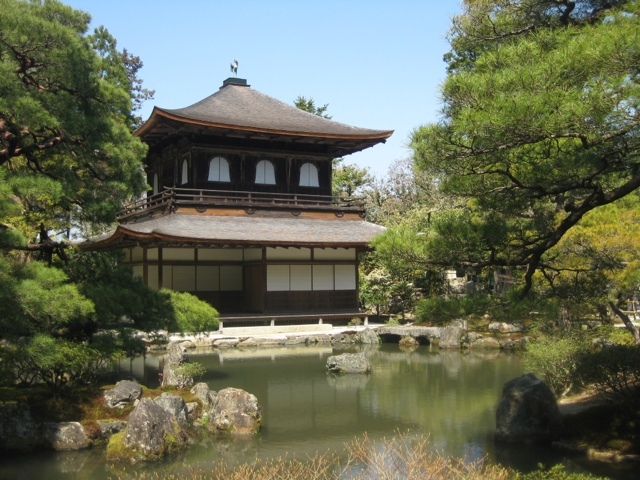 It was founded in the 13th century, and is the head temple of the Rinzai school of Zen. So, here is my theological take-away from my temple visits today. 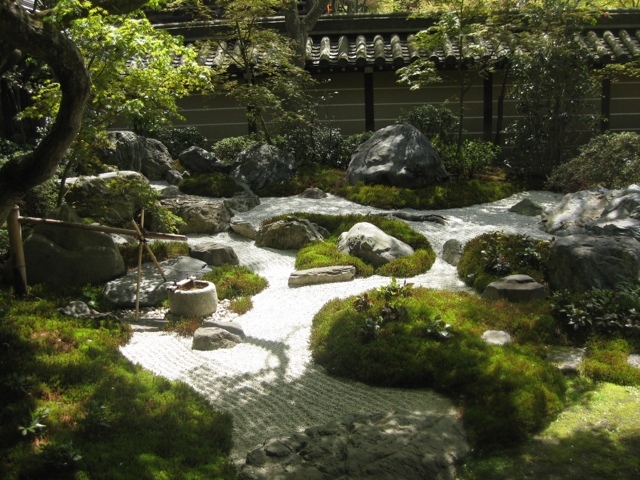 What I find most appealing–both aesthetically and theologically–about Zen temples is the way in which they create such porous boundaries between inside and outside, humanity and nature, the sacred and the secular, and the artificial and the natural. They are built with such deliberate attentiveness to the natural world: what trees are going to bloom when; what architectural style best harmonizes with the surroundings; what natural elements can be incorporated in the physical design and layout of the temple, etc., etc. 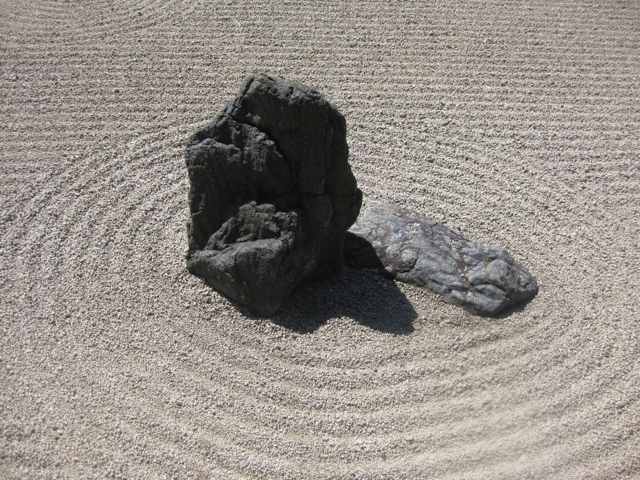 “Harmony” really is the best word to describe it–a quintessentially Japanese/Buddhist concept–and it is so very appealing to me and my religious sensibilities. 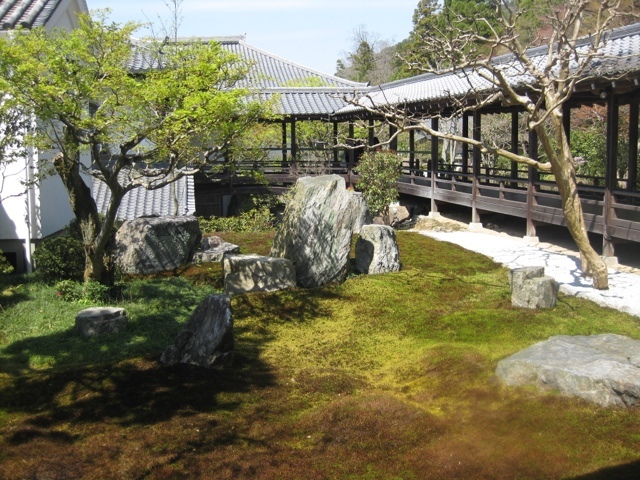 For me, a Zen temple is a explicit, tangible reminder of the pervasiveness of God’s sacramental presence in nature, and our deep, profound connection to the natural world: we both live and worship God in, with and through earth, wind and fire, animal, vegetable and mineral. Our lives and our relationship to God (and to each other) is bound up to our relationship to the rest of creation, and that message is impossible to miss walking around a Zen temple. As much as I love stained glass, I couldn’t help but think about the contrast between being in a church sanctuary where you can’t even see the outdoors, versus being in a space that opens right onto a garden. It sends a very different theological message; and I think the church as a whole really has something to learn from Buddhism here. Now the interlude: I saw in my guidebook that just above Ginkaku-ji is the trailhead of a 5 km hike up to the top of a mountain in Kyoto. 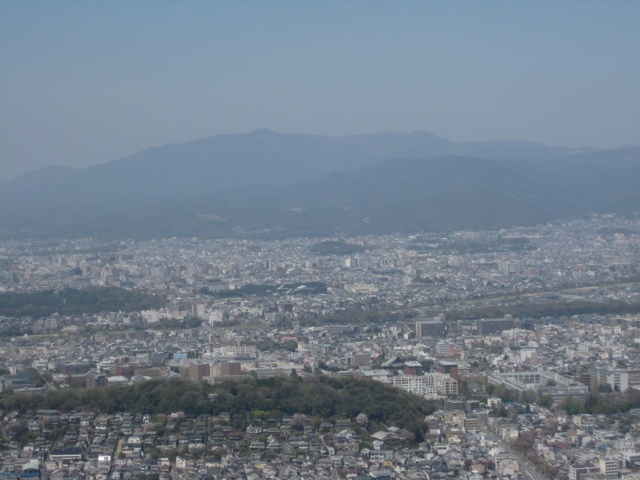 It’s called the Daimonji-yama climb, because its summit is the main site of the Daimon-ji Gozan Okuribi, which is the yearly event [August 16th] that is held to bid farewell to the souls of ancestors. Enormous fires are lit in the form of Chinese characters or other shapes on five mountains in Kyoto: the main fire is in the form of the character “dai,” which means “great–it is the first fire lit, at 8:00 pm, on this mountain. Now, you know I can’t resist a hike, even though I was not exactly in hiking clothes, but luckily today’s cute sandals were also pretty durable and supportive, and so I thought, oh, let’s just do it. 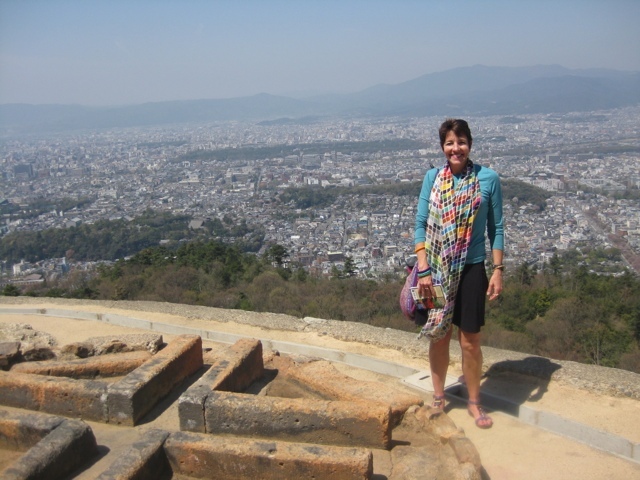 Well, I was so glad I did–the view really was spectacular: I could see the entire city spread out below me. 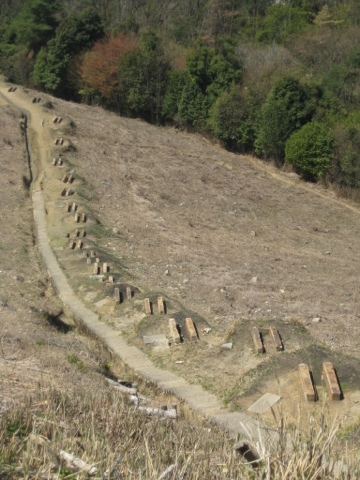 I tried to take some pictures to get a sense of what the Chinese character looked like, too, but it is so large, I couldn’t get a view of the whole: instead, I took a picture of one stroke of the character–you can see the mounds and the metal bars in which the little fires are lit to create the sense of the whole from a distance. 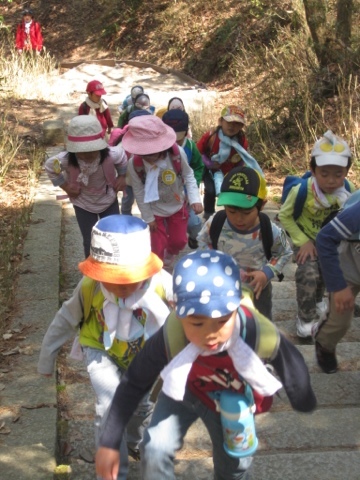 Here was the funniest part, though: as I was huffing and puffing climbing up (it was a challenging climb, to be sure), I passed this group of LITTLE children–I mean, they could not have been more than 4 or 5. 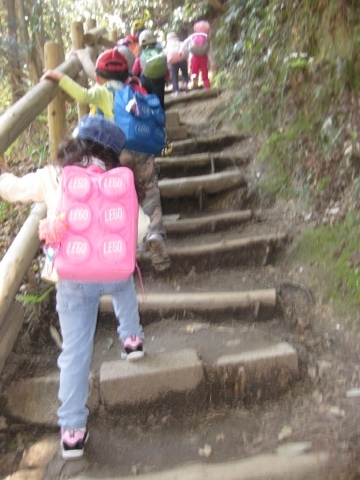 As they were climbing up, they were taking steps that were up to their waist: I couldn’t believe it! And, indeed, as I was coming down, I met them again, bound for the top! 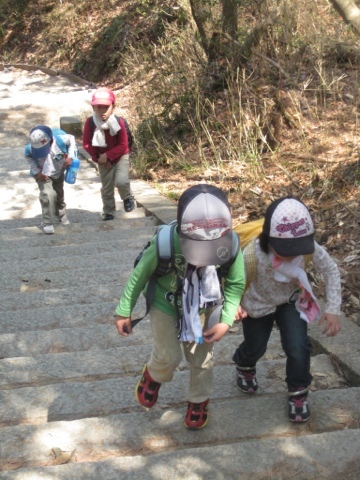 This was a hard, strenuous hike, and these little kids were doing it–I was amazed! They were so cute: even though they couldn’t understand me, I told them I thought they were doing a great job. One of the teachers smiled and laughed–she knew what I was thinking. Those little kids put me to shame, I’ll tell you that! Anyway, that little excursion really extended my day, and earned me a soy mocha from Starbucks on my way home.